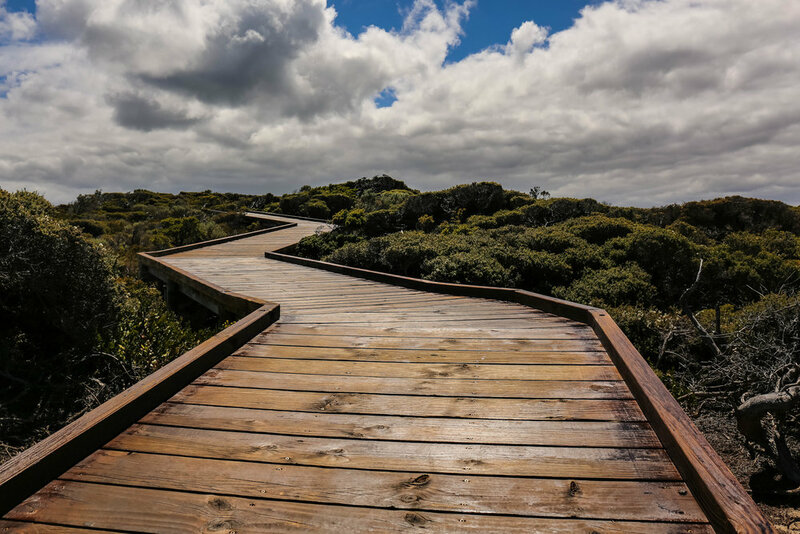 Eventually we manage to drag ourselves away from the indulgence of Southern Ocean Lodge to explore more of Kangaroo Island. 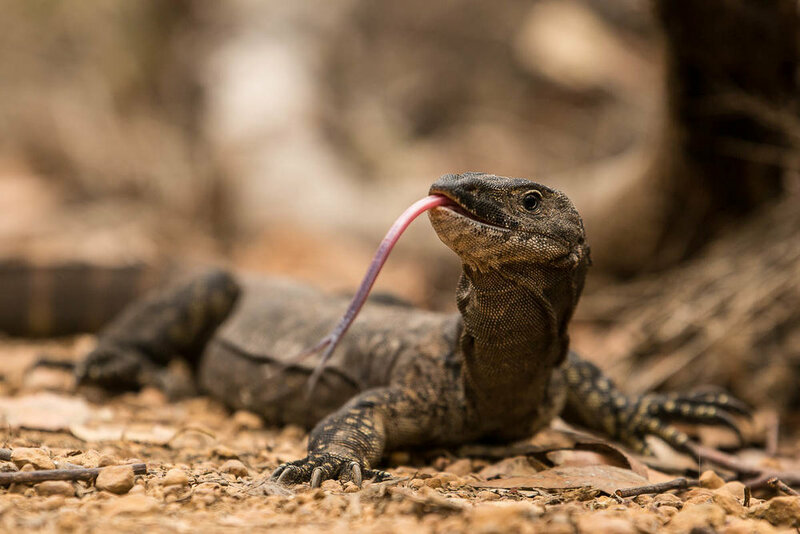 KI, as the locals refer to their island home, has built upon its dramatic scenery and famous wildlife to become a worldclass destination for adventure and food too. On our first adventure we head west from SOL, into Flinders Chase National Park, where the forest meets the sea in dramatic limestone cliffs. 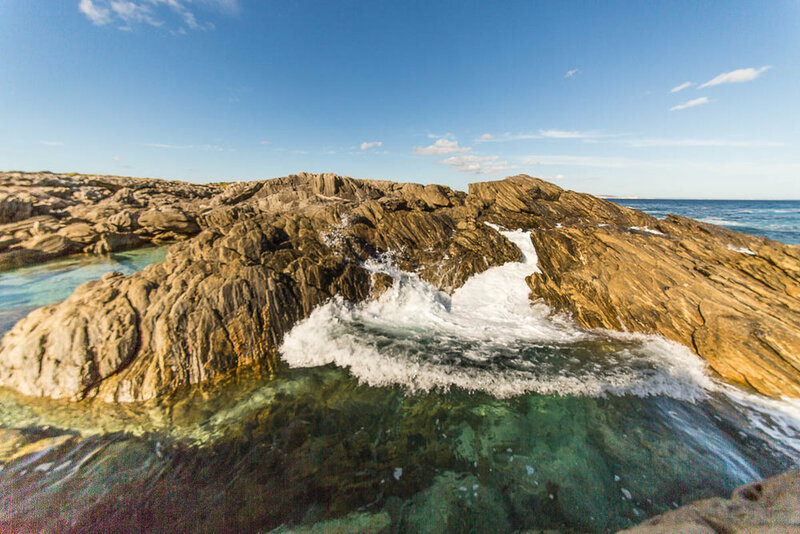 Remarkable Rocks and Admirals Arch are two of the well known sights, but all of this wild headland has incredible vistas, best seen by walking the numerous trails. 500 million years of wind and rain have sculpted the granite at Remarkable Rocks! At Cape du Couedic, fur seals bask and bark on the black rocks, while the photogenic lighthouse is a reminder of the numerous shipwrecks who have met their demise in this wild corner of the world. 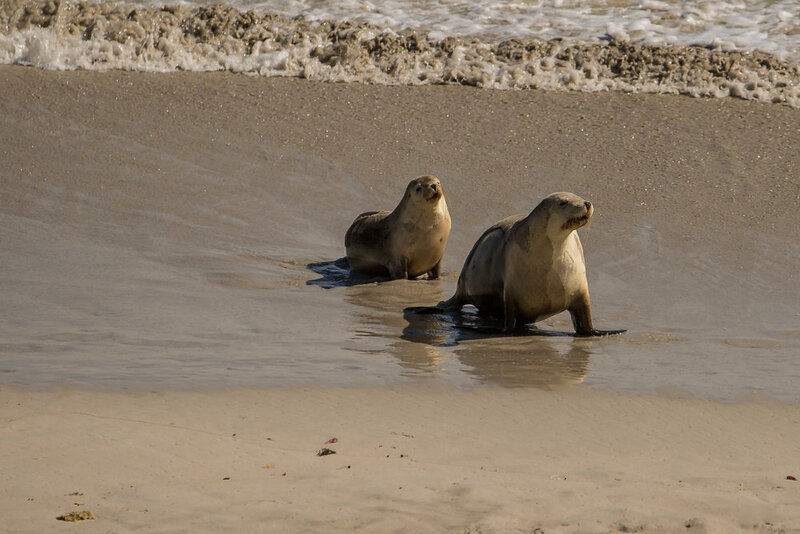 The fur seals are fun to watch, but just hope the wind is coming from behind you! 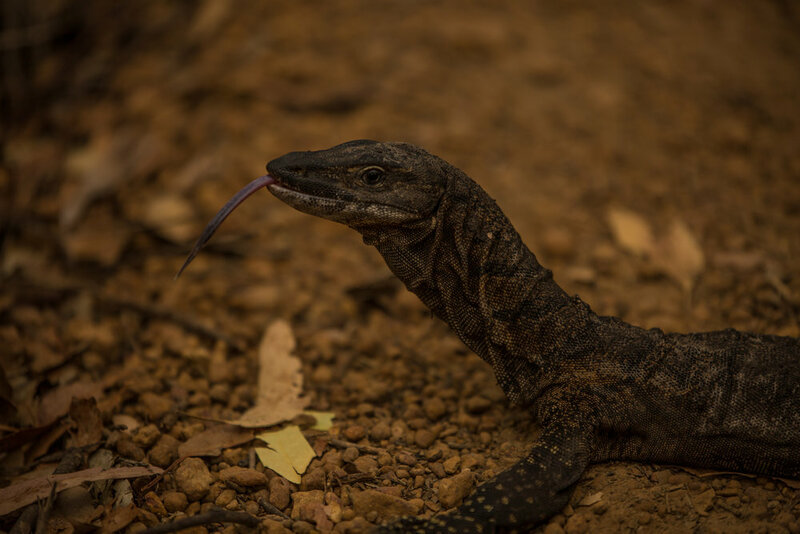 Rounding the headland we return to the forest, pausing en route to explore the Platypus Pools (unsuccessful for platypi, but successful for a massive Rosenberg goanna), before heading north to Cape Borda. Devoid of tourists but awash with wallabies, the lighthouse here is more squat and less picturesque, but the cliffs beyond are no less dramatic. Here a short detour and a steep walking trail take us to the little known Harveys Return Bay, where millenia of geological exploits have created candy-striped cliffs and honeycake-esque outcroppings, and the silica encrusted rocks glimmer like diamonds. 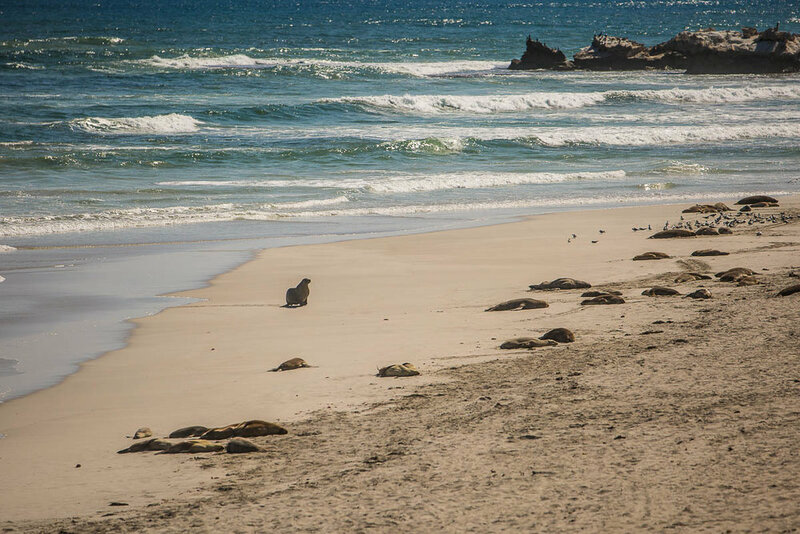 Another day of adventuring sees us exploring the south coast, where the highlight is Seal Bay Conservation Park and its colony of bathing and basking sealions. 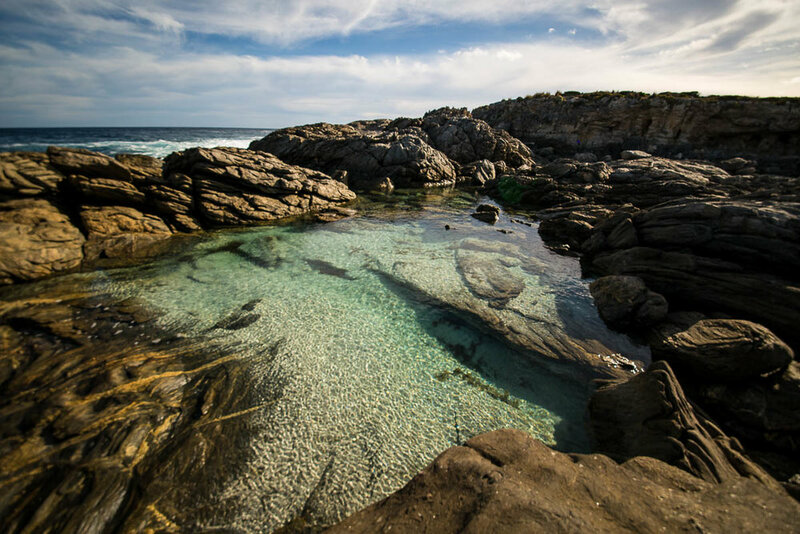 Also on the southern coast, Vivonne Bay has a picturesque beach, while the nearby Point Ellen has slick black rocks and photogenic tidal pools filled by the crashing surf. Our final day of touring is an exploration of the culinary highlights of KI. While pre-trip research and tips from friends had provided an extensive list of tasting options, our meals at Southern Ocean Lodge have already provided us with a stellar sampling of KI’s best food and drinks, from marron and oysters to lamb and olives to ciders and spirits. 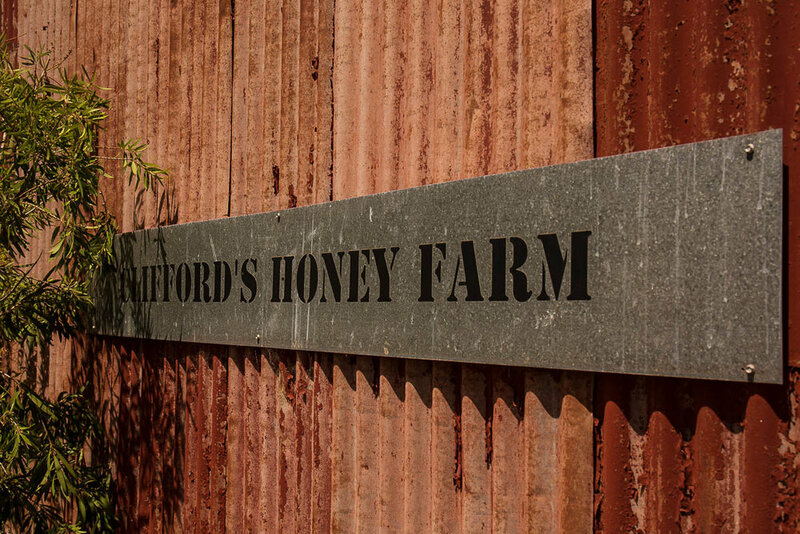 But one can never have enough cheese, so Island Pure Sheep Dairy is our first destination, for tastings and stocking up on produce for the rest of the day – the Manchego is divine, and paired beautifully with the Southrock Lamb chorizo that was also available from their produce fridge. 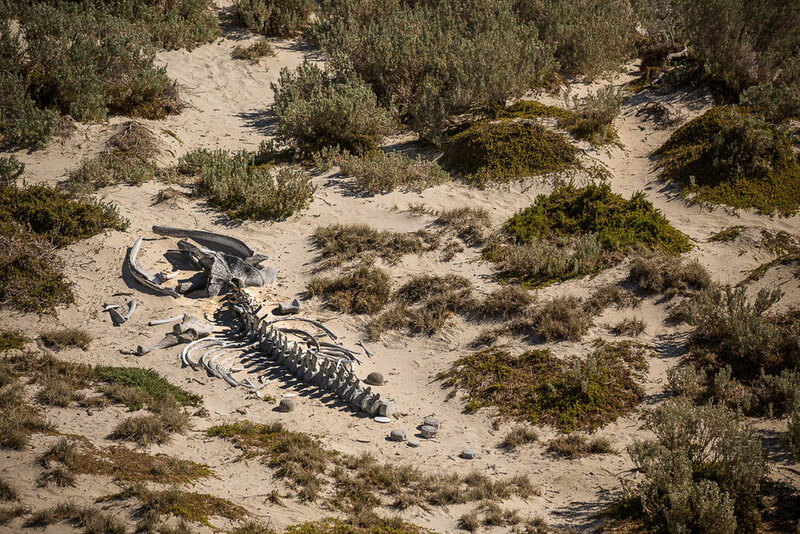 Kangaroo Island is a quintessential Australian destination, with stunning natural beauty, wildlife-filled wilderness, and a burgeoning food and beverage scene, whilst still remaining relatively untouched by mass tourism. Add in Southern Ocean Lodge, a member of Luxury Lodges of Australia and the recipient of hotel accolades from around the world, and Kangaroo Island should definitely shoot up your "must visit" destination list in Australia. 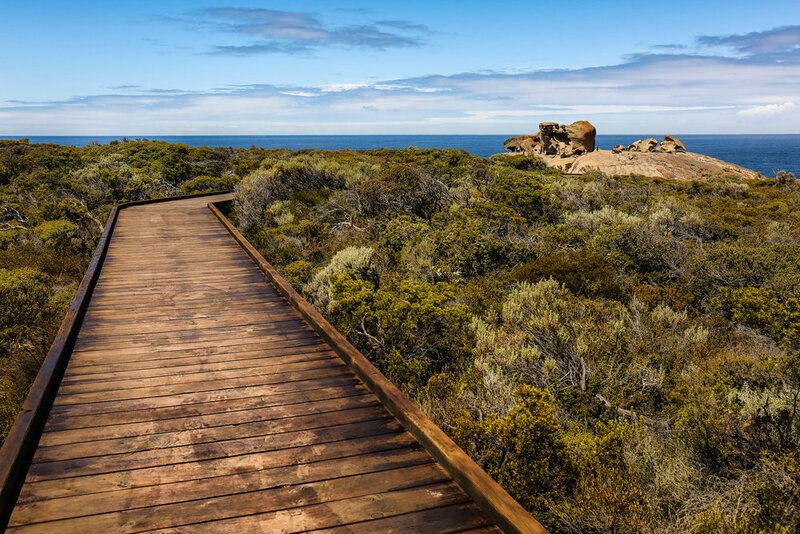 Kangaroo Island's many attractions make it a year-round destination, but keep in mind that the island is particularly exposed to the natural elements, and is often colder and windier than the mainland. You could probably do the island in less time, but we would suggest at least 3 to 4 nights will give you the chance to do it justice. The island is a little bigger and takes a little longer to get around than you might at first expect. And there is plenty to see and do and plenty to eat and drink! For the ultimate in luxury, there really is only one accommodation choice on the island, Southern Ocean Lodge (see our review here). § It is probably a good idea to avoid, or at least limit, the amount of driving you do at night, or even in the evening! The chances of an unfortunate meeting between your vehicle and the local wildlife is extremely high during these times. And even if you have full insurance coverage, dealing with the aftermath is not a lot of fun for either party. If you must drive at these times, we recommend staying well below the speed limit and keeping a very close eye on the road sides. 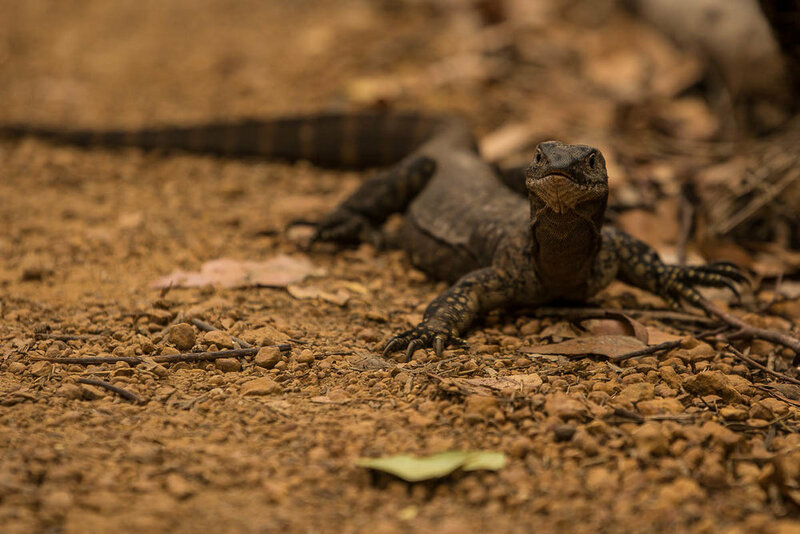 § 4G phone coverage is pretty good throughout the island, but there are dark spots, particularly in Flinders Chase National Park. Coverage is also a little hit and miss at Southern Ocean Lodge (but the Lodge wifi makes up for it). § You are quite a long way south, and there is nothing between the island and Antarctica but the Southern Ocean. This means winds are prevalent, and they are generally crisp, so always carry something to keep you warm and ideally block out the cool breeze. 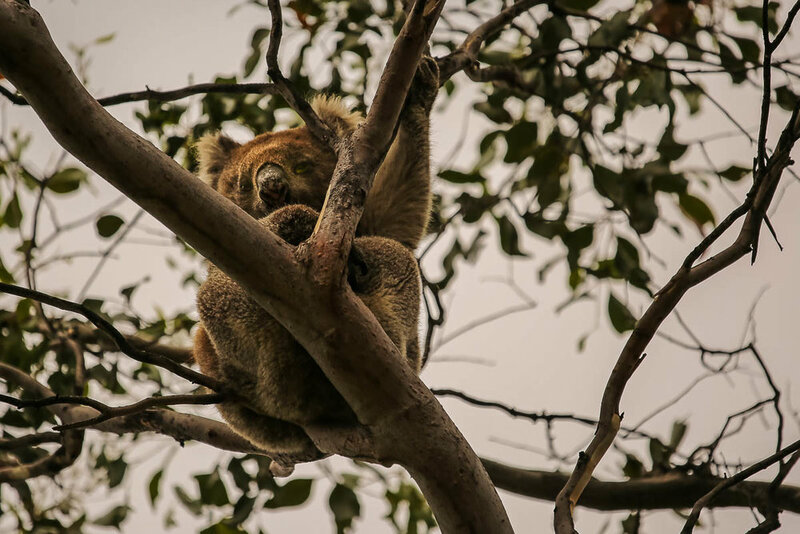 Hard to believe … but this was our first wild Koala (we don’t get them in the West)! It’s “Ligurian” bees are believed to be the last remaining “pure stock” of it’s type anywhere in the world.